Long before games existed as we know them now, ‘video games’ consisted of text-based adventures that demanded just as much imagination from the players as they did input. Dungeon crawlers were a popular genre at the time, one in which you guided a protagonist room by room through sprawling, confusing castles guided only by your wits and memory. 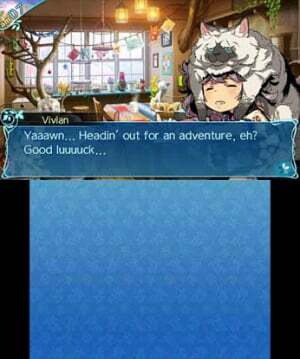 Though the days of text adventures have long since passed, the Etrian Odyssey series has kept their spirit alive through its decidedly old-school gameplay, and though it may not be to everyone’s taste, Etrian Odyssey Nexus stands as the purest distillation of the series formula yet. As far as story is concerned, Etrian Odyssey Nexus is rather unique in how its story focuses only partially on a pre-defined plot; broad strokes and story beats are laid out in a standard fashion, but much of the narrative will come from small, player-driven decision moments that occur rather frequently when exploring the labyrinths. The overarching story centres on the floating city of Maginia, to which Princess Persephone has invited all adventurers in the land to explore the mysteries of Lemuria and the Yggdrasil Tree that it houses, and you play as the leader of a new guild that has come to answer the call. Unlike some other games in the series, which dabbled in creating a more character-driven plot, Etrian Odyssey Nexus merely offers up this sort of rough framework, which is filled in by your own unique experiences. As you crawl through the seemingly endless dungeons, you’ll occasionally come upon tiles that prompt your guild with making a series of decisions, the outcome of which can result in either positive or negative effects. For example, one memorable instance early on saw our guild come into contact with a fruit tree, and the game asked whether or not we wanted to send someone up to try picking some fruit. After choosing someone to go, we had to periodically choose whether to let them come down or keep picking more fruit; the outcome resulted in our party getting a nice boost to their health, but it could’ve just as easily ended in them being poisoned or our chosen unit falling out of the tree and mortally injuring themselves. It’s these emergent moments that make Etrian Odyssey feel rather special in its storytelling, as you develop quite a bond with your otherwise flat characters. Rather than the game itself dictating the kinds of characters that constitute your party, the character development comes from player-driven choices such as this. As a sort of ‘greatest hits’ release for the series, Etrian Odyssey Nexus features a whopping nineteen classes to choose from when building a team, of which you can bring five at a time into the mazes. As you’d expect, this leads to a staggering, almost overwhelming amount of player choice in how a team is built, but the game is relatively lenient in allowing just about anything to fly; there aren’t really any wrong answers here regarding how a team should be built, but you’re going to have a bad time if you try running a squad of five pure medics. Things become even more granular once you boost a character past a certain level threshold, which allows you to then add any of the other eighteen classes to them as a subclass, granting them access to the skills, weapons, and armour of that class. If you’ve ever been the sort of player that doesn’t like to feel boxed-in with an RPG regarding character growth, Etrian Odyssey Nexus is the game for you; there’s next to no limit on what you can do with how you build out a squad, and the game almost begs you to find ways to ‘break’ the system. Once you’ve arranged a squad that you’re comfortable with, you can then dive into one of the game’s labyrinths and begin exploring away from a first-person perspective. 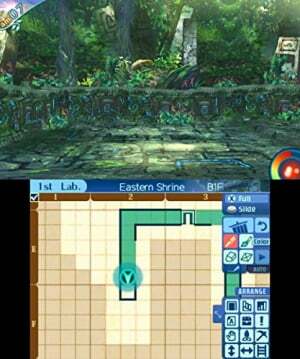 As you walk, it’s up to you to draw your own map on the bottom screen, filling in the empty grid with lines, squares, and icons to represent things like walls, doorways, and enemy locations. Those of you that don’t want to waste the time can activate a convenient auto-map feature in the settings, but there’s something to be said about the experience of slowly putting together your own maps and watching them grow in complexity; much like the player-driven storytelling, it does a great job of adding extra layers to the immersion factor. Finding that staircase that leads to the next floor, or uncovering a treasure chest tucked away in a corner; these are events that feel like much more of an accomplishment when the game isn’t simply handing over a map. Enemy encounters are mostly handled randomly; a small meter on the screen fills up a little bit every step you take and eventually triggers a fight once it reaches the top. The battle screen retains the first-person view, tasking you with clicking through endless menus as you set up each character’s action for that turn. Both your team and the enemy team are laid out with a frontline and backline, with the backline generally being harder to attack, so finding good team synergy is critical to overcoming the hordes of monsters and animals that roam the mazes. Some classes specialize in buffs and debuffs, others are good at tanking damage, while others are good at handing damage out; it’s up to you to best discern which character abilities and attacks are suitable in any given situation. White-knuckling your way through fights with basic attacks is a passable strat early on, but later levels demand that you learn the intricacies of each class and how they can best contribute to the overall effort. All the standard turn-based JRPG actions are available here (using items, attacks, running away, and so on), but a cool addition that helps spice things up a bit more is the usage of the force gauge. Each character has a gauge that slowly fills every turn, and once full, it lets them activate their Boost, a passive ability that significantly enhances their battle effectiveness in some way. For example, the Arcanist – a class that specializes in laying down temporary debuffs that affect the whole enemy team – has a Boost that prevents their debuffs from decaying with each turn, while also raising the chance that enemy units are affected by the debuff. Every class’s Boost is only active for three turns, after which the force gauge has to recharge, but you’re given the choice to either let it run out or activate that unit’s Break. A Break is a special, game-changing attack unique to each class, and while they can singlehandedly change the outcome of a tense boss fight, using a unit’s Break will disable their force gauge for the rest of that current run through the maze. Although the base combat system has plenty of depth and difficulty, this Boost/Break system helps to add a nice layer of extra strategy to proceedings, injecting a healthy dynamic element to the otherwise static battles. 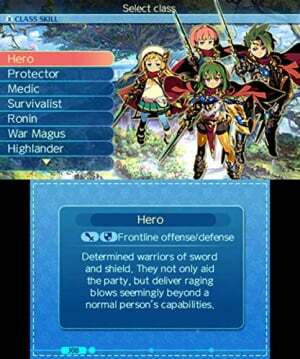 Although the bulk of your combat experience comes from random battles, Etrian Odyssey Nexus also brings back the F.O.E. (Field-On Enemies) system, in which especially powerful, boss-like enemies appear on the map and must be manoeuvred around as you explore. Generally speaking, your team isn’t powerful enough to take on the F.O.E.s for a given floor when you first come to visit, so avoiding them is the best option, and the game helps facilitate this by showing where they are relative to your location. Every now and then, however, F.O.E.s have to be used to progress further in a dungeon, such as baiting them into breaking down walls, and this can lead to deliciously tense chases down long corridors and twisting paths. F.O.E.s only take a step when you do, but it can still be all too easy to get backed into a corner and forced into a fight. If you can take them down, there are some incredible rewards to be had, and coming back to a dungeon once you’ve levelled up more can lead to some extremely rewarding fights against enemies that once dwarfed your own combat effectiveness. 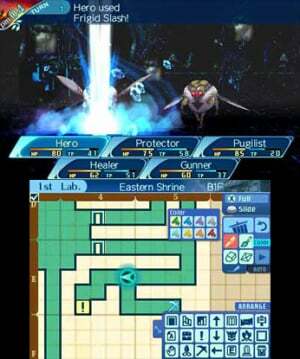 A dungeon crawler such as Etrian Odyssey Nexus is always in danger of becoming a stagnant or repetitive experience, but this F.O.E. system goes a long way towards making every run through a dungeon something special by introducing some real, serious stakes to every step you take. Every battle sees you getting a lump sum of XP that’s evenly distributed to every conscious member of your team, and when a unit levels up, their stats see a small bump and they’re granted one point to invest in a chosen ability in the skill tree. Every unit has a skill tree divided into three parts according to what level threshold they’ve reached, with the latter skills obviously being quite powerful. However, reaching the desired skill usually takes a fair bit of planning, as you have to first unlock the right to activate it by upgrading lesser skills a certain amount. You’re given full view of a skill tree right from the beginning so you can best plan out a unit’s build, and every decision you make along the way feels impactful and meaningful. Most skills can have several points invested into them to boost their effectiveness, and due to the relatively slow drip of points that you’re given, it becomes critical to find that balance between what you’re currently using and what you’re going to use several levels on from here. Much like with team composition and subclassing, this granularity gives you complete freedom in how your characters shape up, which can be either stressful or welcome, depending on what kind of player you are. Once you’re finished with a dungeon run (usually when you’ve run out of TP to power your special attacks), you can then take the team back to Maginia to rest up and restock on items and weapons. A shop in town will buy enemy drops off you and create new armour and weapon sets to utilize them, along with offering you the opportunity to use those parts to augment already existing gear. Meanwhile, a tavern nearby gives you the chance to talk with NPCs and pick up or turn in sidequests; these mostly consist of unmemorable fetch quests, but they nonetheless help to give more purpose to each run through a dungeon. More importantly, this constantly revolving dynamic of bouncing between town and dungeon creates a satisfying and rewarding feedback loop that keeps you coming back for more; every town visit gives you the material and motivation to go a little further into the dungeon next time, while every dungeon visit sees you racking up tons of sellable items and treasures for subsequent visits to town. It all fits very nicely together, and though it isn’t anything very complicated, this simplicity of design can be quite effective in keeping you unaware of how many real-time hours are slipping by. 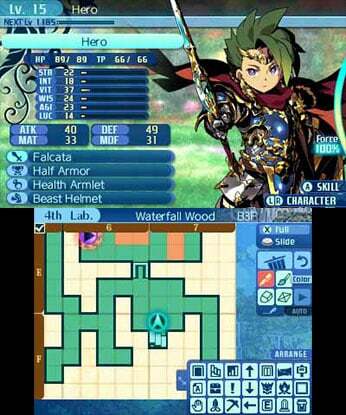 This being a dungeon crawler, Etrian Odyssey Nexus has an interesting graphical style that’s as much about menu navigation and design as it is about the actual graphics. For example, the town of Maginia isn’t an actual town that you can explore, it’s simply a menu that lets you select where you want to ‘go’, which then brings up background art and character portraits that fit the setting. The dungeons, on the other hand, are beautifully well-realized environments full of detail and colour, accompanied by enemy models that are basic, but well animated. Etrian Odyssey Nexus isn’t exactly a knockout in terms of its graphical style, but it certainly does deserve an extra nod for its tremendous usage of stereoscopic 3D, a foundational system feature that even Nintendo itself has been mostly ignoring as of late. Looking down a corridor and truly seeing how far down it goes, or scrolling through battle menus with four or five different layers, is an experience that adds a surprising amount to the game; that added depth gives everything it touches a distinct sort of presence that helps contribute to the immersion that’s clearly being attempted. It works well, and though Etrian Odyssey Nexus is no system showcase, it has a distinct way of drawing you into its world that few other games on the 3DS can match. This is helped in no small way by the absolutely stellar soundtrack by Yuzo Koshiro, industry legend and longtime composer for the Etrian Odyssey series. The orchestral tracks mix pianos, strings, and soft percussion to create relaxing, dreamlike tracks that call to mind some of the work from Studio Ghibli film. This music does a fantastic job of drawing you into the gameplay and instilling a sense of wonder as you traipse your way through mossy stone temples and other such locations. In battle, the music tempo picks up considerably and adds in some electric guitars to spice things up, but it still doesn’t lose that chilled sense of adventure that the rest of the soundtrack builds. Rest assured, you’re sure to find a few tracks in Etrian Odyssey Nexus that will stick with you for a while after putting the game down. 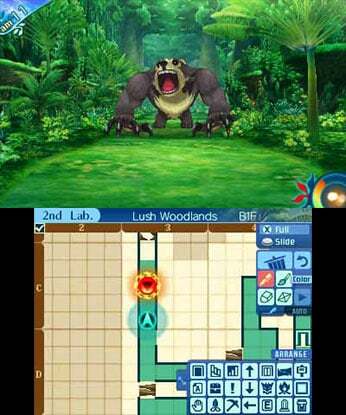 Given that the Etrian Odyssey series depends so heavily on the dual-screen design of Nintendo’s departing family of handhelds, it’s not entirely clear what form (if any) the series will take going forward. Even so, if Etrian Odyssey Nexus is to be the final entry in this much-beloved series, we can’t think of a better way for it to go out. Staggering amounts of character customization, a beautifully arranged soundtrack, dozens of hours of content, and excellent usage of stereoscopic 3D all combine to make this the definitive Etrian Odyssey experience. 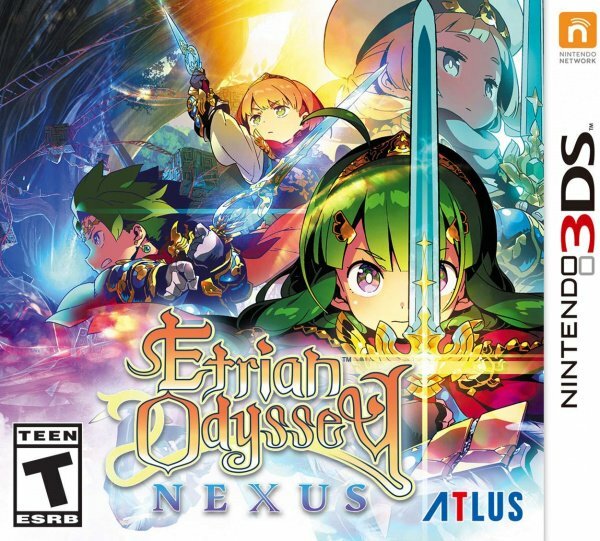 We’d recommend Etrian Odyssey Nexus to both longtime fans and newcomers looking to see what all the fuss is about; this is one of the deepest and most involved RPGs you’re likely to find on the 3DS, and it stands as a compelling reason to dust off Nintendo’s handheld once more. I've heard excellent things about this series, so I've gotta give this and Persona Q2 a try. Etrian Odyssey is great, but I have like 3 of them in my backlog even now. I'm going to have to skip this. See you again on Switch (I hope). This seems like a great way to send off the series (in its traditional form at least). Kind of EO's Smash Ultimate moment. Anyway, between this and Persona Q2, my 3DS is going to have a ton of life in it yet. I haven't played a single minute of any EO game. Was that Lush Woodlands from EO4 there? Does this include areas from other games? 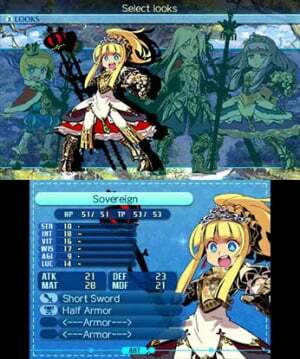 I really loved Etrian Odyssey IV so good to see the series is still going strong. I won't be buying this though as 100% of my gaming time is now on the Switch and no longer use my 3DS. Hopefully they can find a way to bring the series to the Switch but it might be hard given how integral the touch screen is for map drawing. @nessisonett It includes classes and dungeons from previous games. It's a celebration of each previous game in the series. I’m seriously considering this one. I’ve only ever played Untold 1 and I enjoyed it, but not enough to see it trough to the end. Has the series changed significantly since Untold? @gcunit Guess I’m not the only one. Own every single one and played like 5 min of the first just to try out. Yet I buy them as they look interesting and if I didn’t now they’d have a heck of a mark up in the future. I never bought an Etrian Odyssey game for many reasons but I will buy this one, I like new experiences and the fact this one is a kind of Best Of makes it the most obvious choice to start. bought and played 1 thru 4. Played less and less of each consecutive game though. Feel like this series has a lot of untapped potential. But maybe it just is what it is. Would take some innovation to bring me back at this point. @gcunit I do that with some game series too, but I mean to sit down and play those eventually. THAT stops me from even considering picking up any entry in this game series, it sounds like a single game will easily eat a whole month of my life. There is no way I'll ever go through the series. Love these games - they are amazing. My 3DS has never gathered any dust., I play my 3DS as much if not more than my Switch. I still have a ton of titles to keep me busy and I'm still just as amazed by the stereoscopic 3D effect as I was the day I purchased my 3DS, I truly hope Nintendo don't completely do away with the stereoscopic 3D going forward it is such a fantastic feature for video games. Only recently got into this series, I am glad they are using 3D feature for this title, will be buying this as a result! I might get this one as I've never played the series but have been interested in it. Of course if I do it will probably just sit on the shelf for a couple of years before I play it. I tried to like this franchise with EO:IV, but it's definitely not for me. Too much grinding and way too slow progression for my tastes. Do I need to play the other games to understand this ones story? Absolutely love this series. I own every entry and have this one preordered! @ZacharyThomas No. Each game stands alone. I'm on the fence. I like these games but they're exhausting to play at times. Considering Atlus' games have a history of going out of print quickly, I've preordered this one even though I have some of them in my backlog already. Don't want to have to hunt down an overpriced copy down the line. Until the 3DS game family goes it's still a viable platform. No other console makers have such competition for 3DS. Wait this franchise not coming to the switch? "And for the 3DS itself?" 3ds is killing it. Last few months I’ve bought 22 physical games for 3ds. It’s an amazing device. I’ve pre-ordered Nexus and I’m glad this game is getting stellar reviews. My 3ds will be active for a long time. A fitting final game for me to get for the 3DS. Etrian Odyssey 4 was my first game in the series, and I have played every one since. I wonder what's next for the series. I can't imagine playing it without a second screen or a touch screen. @Mando44646 as you can read in the review there is auto-map feature. @koekiemonster I'll keep buying games for the 3DS as long as they keep releasing them! Just got Bowser's Inside Story, getting this tomorrow, Kirby in March and will pre-order Persona Q2 as soon as it's up for pre-order in Europe! The 3DS really is my favourite gaming system of all time, and I couldn't care less that the hardware is aging. I love my Switch, but the 3DS is the system that completely reinvigorated the joy of gaming for me. Hoping Nintendo still have a few unannounced titles in the works! Likely my last 3DS title. And just like all the other EOs, I'll never even come close to finishing it. ... and not a simultaneous release on Switch becaaauuuse.... ? @aznable does the switch has two screens? Also does the Switch already has the engine in place? So, if i wanted to buy just one EO, this is the one? Not a single mention, NintendoLife, that (like Persona Q2), this game ONLY features a voicetrack in Japanese, even for English-language regions? One would think that would be something worth mentioning in the review. @Averagewriter Personally, it's something I barely noticed. This series is obviously heavily geared towards Japanese audiences, and given that there isn't much focus on story to begin with, it doesn't seem remotely unusual that there's no English VO. @SwitchVogel All the other games in the series have an English VO. Exactly, everyone's wondering about how much life is still in the 3ds and talking about dusting off their old 3ds. The Game Boy systems sold steadily for eight years, 3ds has at least a year left in it. @Arnold-Kage unknown. The biggest mechanic this series is known for is centered on the dual screens of the DS and 3DS (along with the stylus - drawing a map with your finger would be worse). If it comes to Switch, it’ll be drastically different. But this could just as easily be the end of the series, or at least a hiatus until we get another dual screen console someday. @abbyhitter That's not saying much when the only games with voice acting in the series are spinoffs and one mainline entry. @lightwolf6 Except the Gameboy’s sales weren’t cannibalized by another Nintendo handheld. The Switch’s portable nature kind of puts it in competition with the 3DS, and if sales figures are any indication, the 3DS is undoubtedly circling the drain. @abbyhitter I wasn't aware of that. Even so, I don't consider it to be a big deal; story isn't very important here and that doesn't change whether the shopkeep speaks in Japanese or English. Oh goody, been looking forward to nexus!! Can't wait. If you like the eo series, get into Labyrinth of Refrain: Coven of Dusk on switch! I've only played through EO 1 on the DS but I really enjoyed it and it stands as one of my greatest on the system. Looking to get back into the series with a friend but not sure which one to start with. Maybe I'll just go for this since it's the newest one, and it's like a greatest hits game. •They all feel very very similar— some of the enemies are even reused with the same assets! •random encounters grow tiring just like they do in other games. •I’ve never actually beaten one of them despite being totally engaged in the story and gameplay (so it’s tough to buy these new(er) releases. That being said, if anyone has not played these games or only owns 1 or many I totally give you my recommendation to buy. It’s going to be very interesting to see what becomes of this series with the Switch taking front and center. That was partially my gripe too with these games; they haven’t moved forward enough to give me that, “oh I have to buy the new one!” drive. As this is probably the last one on the 3DS, I might actually bite because I like the series so much. But beyond that I’m expecting pretty much the same experience overall. And that’s not necessarily a bad thing. @NicolausCamp THIS. Yes! The Switch is fantastic... but 3DS is just .... it’s just FUN. I enjoy it so much. It's unbelievable how many Etrian games are on the 3ds! All good things must come to an end but here's hoping for a good start for a Switch version which I'm sure is already well under way! Might even see better sales on the Switch too. You do have to factor in that there will be people who can't or won't buy a switch, for at least 25 reasons. As long as they make software for the system, someone will buy it. another Zelda game for the 3ds would bring in a huge amount of revenue.The Game Boy did, in fact have MANY competing systems, though none by Nintendo, many were more advanced and one had even better battery life. Atlus has really supported the 3DS system from beginning to end. Since 2017, it's basically been Nintendo IPs and Atlus products. I'm sure this was in production before they realized the sales weren't gonna be there and they decided to just get it out and move on. I'll pick this up and save it for a rainy day when I'm feeling nostalgic for this type of game. I've had my fill for now. So excited to be getting one more, especially one with such replay potential from all those classes! The genre isn't for everyone, but EO is the unquestioned king of the genre in my book (and second place isn't particularly close). And there will probably never be another system as well-suited for these games as the 3DS. That's what makes the series special. What are you talking about “it’s not entirely clear what form (if any) the series will take going forward. Even so, if Etrian Odyssey Nexus is to be the final entry in this much-beloved series”? “We are now moving quickly toward a completely new world for the Etrian Odyssey series that everyone has supported thus far” -Atlus. @lightwolf6 New releases on 3DS have woefully underperformed since the Switch released. Look at the numbers. The 3DS and its software accounted for less than 10% of Nintendo’s revenue last year. People just aren’t interested anymore like they used to be. Nintendo knows this. That’s why all the “new” 3DS games coming out are ports and remakes that reuse existing assets. They know it’s a bad idea to waste development resources on a handheld so clearly falling out of favor. @koekiemonster l'idée de deux écrans est un gimmick, c'est pas nécessaire pour le jouer. c'est appelé "mini-map." Surtout car le switch a un écran tactile. mais seriously the switch est a superior piece d'outils. Ah, so this one does have an auto-map option? Well, at least they're learning, but the lack of a good story still really hurts. If you want a good first-person dungeon-crawling JRPG, get "Unchained Blades" instead. @locky-mavo I understand that, but one way or another, this is the last Etrian Odyssey as we know it. Whatever comes next will be an evolution, they'll have to change it in some ways to adapt to one screen. @turntSNACO King of the genre? I don't think so. Even if you're restricting the genre to first-person, dungeon-crawling JRPGs, "Unchained Blades" is much better, mostly due to having an auto-map, a real quality story, and English voice overs. @BulbasaurusRex I did say it was king "in my book". I can appreciate that manual mapping and limited story are negatives for you. They're positives for me. It's not bad game design just because it doesn't appeal to you. I'll happily discuss why I think manual mapping is a good design choice if you'd like, but for now I'll say that you and I simply want different things out the genre and that's ok! @BulbasaurusRex And yet, the sequel, UnchainBlade EXXIV, stayed Japan-only. @Expa0 Yeah I haven’t finished any of them, but they are excellent. I even own the first three on DS and their 3DS remakes. They are so large and grindy though, because those F.O.Es are tough. @Romeo-75 Well said! Same here, brother! I still play my 3DS all the time, and I have tons of games to get to on that system. I play my Switch too, but the 3DS library still blows the Switch off the map. I might snag this game later, but for now I’ll just add it to my wish list as I have a bunch ahead of it. Glad to see it come out for 3DS though, I’ll get to it in due time. It has more become a Switch fanboy-site...never a bad word about the Switch. •Sega 3D Classics (Outrun, Galaxy Force, Space Harrier, Hang On, SoR, Gunstar Heroes...) In pop-out mode, anything using Sega’s arcade scaler engine looks bloody amazing. @SwitchVogel so you “understandingly” chose word it that way then? Knowing that even if it’s an “evolution” of the game series, it would be a form (if any) and it wouldn’t be the last in the series, right? Only games I'm missing are the Mystery dungeons games I never knew existed. Great series. The old school dungeon crawler has room for new life. Even taking a side-by-side splitscreen approach could be cool, allowing us to use the touchscreen to map out the dungeons.